มกราคม 2562 คนกรุงเทพฯ อยู่ในอากาศปนเปื้อนฝุ่นพิษ PM2.5 เกินมาตรฐานมาแล้วกี่วัน? Author Tara BuakamsriPosted on 30/01/2019 07/02/2019 Categories มลพิษทางอากาศ Air PollutionTags Air Pollution, Bangkok, PM2.5Leave a comment on มกราคม 2562 คนกรุงเทพฯ อยู่ในอากาศปนเปื้อนฝุ่นพิษ PM2.5 เกินมาตรฐานมาแล้วกี่วัน? In a city like Bangkok where bumper-to-bumper traffic, raging heat and all-consuming noise are enough to give you a migraine, a clear city skyline is a welcome view to make you appreciate this bustling city. But hovering over Bangkok and other cities like it, lies a hidden layer that’s affecting the health of millions. Air pollution is one of the most pressing issues in major Thai cities. A 2015 study by the University of Washington and supported by the World Bank, shows that air pollution causes 50,000 premature deaths in the country yearly. Most at risk are children and the elderly, and people living in areas near coal-fired power plants and polluting industries. At the heart of it is the invisible and harmful pollutant, PM2.5. Measuring less than 2.5 micrometres in diameter — less than the width of a single human hair — particulate matter (PM) 2.5 is the worst form of air pollution. PM2.5 penetrates deeply into the lungs, allowing harmful chemicals to be carried into internal organs; and is attributed to causing a wide range of illnesses including cancer, strokes, respiratory diseases, foetal damage and even death. Globally, air pollution is turning out to be a very serious issue. According to Unicef, it contributes to the deaths of around 600,000 children each year; and a recent World Bank study has shown that total deaths from air pollution have risen in Thailand from roughly 31,000 in 1990 to 48,000 in 2013. In fact, Thailand’s Pollution Control Department has identified ground-level ozone and airborne particles as the two pollutants that pose the greatest threats to human health. Unfortunately, PM2.5 levels in many parts of Thailand are way above acceptable levels. The annual safe limit according to Thailand’s National Ambient Air Quality Standard is at 25 microgrammes per cubic metre, a figure Thailand’s major cities have failed to reach for the past several years. Greenpeace Southeast Asia recently looked into this. Our recent report ranked Thai cities according to their PM2.5 readings — the first of its kind for the country — and what we found highlights the hidden public health crisis we have on our hands. Based on 2015 data, out of 29 provinces that are equipped with air monitoring stations, 23 exceeded the average annual particulate matter of less than 10 micrometres (PM10) levels. Between January-May this year, the five cities with the highest annual average concentrations of PM2.5 were Chiang Mai, Khon Kaen, Lampang, Bangkok and Ratchaburi. This means, that there are levels reaching into “unhealthy”, “very unhealthy” and “hazardous” levels, according to the World Health Organisation. If you want a real-time measurement of what we’re breathing, there is a website that you can check out the visual map, just key “Bangkok AQI”. So why isn’t the Thai government factoring in PM2.5? Many other countries such as China and India have already incorporated PM2.5 in their air quality indexes, and PM2.5 concentrations are crucial in determining the country’s smog and pollution alerts. In Beijing, residents are advised to wear masks and avoid outdoor activities in similar circumstances. In Delhi, a severe bout of smog enveloped the city and the government was forced to temporarily shut down schools. But the same warnings or measures are not in place in Thailand. The country is well equipped to do so though. Although pollution monitoring stations are capable of measuring PM2.5 concentrations, Thailand’s Air Quality Index (AQI) does not factor it in. While the AQI provides Thais with timely and reliable information about air pollution levels, it only considers PM10 (larger dust particles). Comparatively, the World Health Organisation also uses PM2.5 AQI values, rather than PM10, to more accurately judge potential health effects from pollution. So if PM2.5 can give us a better understanding of pollution and the toll it takes on human lives, why is this silent killer hidden from official data? The unfettered growth of industries, the construction of even more coal-fired power plants, the addition of more vehicles on our roads, and the unsolved haze problem from Indonesia affecting Thailand and other Southeast Asian countries will mean pollution will certainly worsen in the coming years. To protect people’s health, the Thai government needs to urgently upgrade the AQI to include PM2.5. Additionally, it should strengthen pollution monitoring and regulation of existing coal plants and shift away from the use of coal. PM2.5 and mercury emissions should be measured at source, and the current standards for other toxic pollutants such as sulphur oxides and nitrous oxides, aside from dust emissions should be reviewed. Legal protection for the right to clean air in Thailand is inadequate and will remain so as long as the government continues to sacrifice public health whenever it is perceived to come into conflict with industry. The Thai government must take a step back from this myopic approach and tackle the issue from a public health perspective. The government must challenge industry to meet better standards through innovation — and thus pave the way for a sustainable approach to pollution prevention. It would be easy to assume, at first glance, that the watery rectangle in the center of this image is a harbor. Narrow structures extend into the blue water like docks; small white dots break up field of blue like ships on water; and the structures lining the area resemble large warehouses. But on closer inspection, it becomes clear that the white dots are airplanes, and that the watery rectangle is the submerged runway complex of the Don Muang Airport. Located north of downtown Bangkok, the airport is in one of 31 districts affected by flooding in the Thai capital. All 50 districts remain under threat, according to local officials. 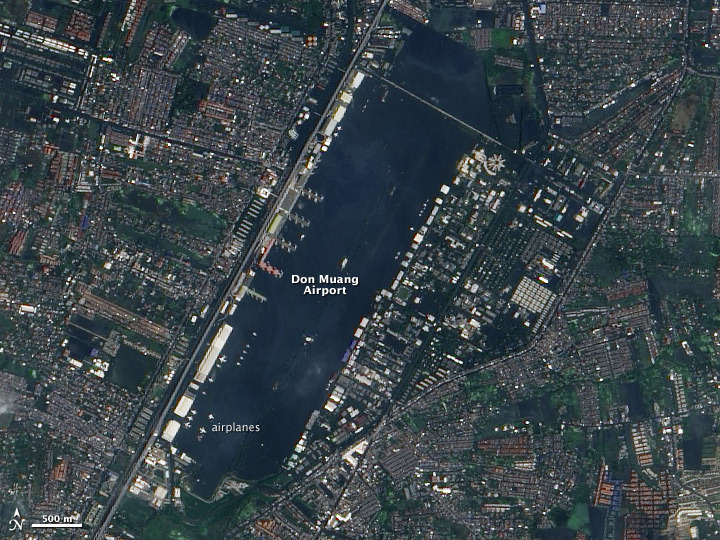 The Advanced Land Imager (ALI) on NASA’s Earth Observing-1 (EO-1) satellite took this image of Bangkok on October 29, 2011. Flooding is most obvious at the airport, but much of the area in the image is flooded. The spaces between buildings and under trees are blue. Signs of flooding are also evident throughout the large image, which includes a much wider area. The floods started in late July as unusually heavy monsoon rains and a tropical cyclone inundated Thailand. Floods swelled rivers and filled reservoirs throughout the country. By late October, the floods reached Bangkok through the Chao Phraya River and numerous canals and smaller waterways. As of October 30, the floods had claimed 373 lives and affected more than two million people, said the government of Thailand. The Don Muang Airport (also Don Mueang) started to flood on October 25 during a period of high tides. Even as floods were draining into the Gulf of Thailand on Bangkok’s southern shores, high tides pushed back, amplifying the floods. The Chao Phraya reached record levels on October 25, and floods spread across parts of Bangkok. The high tides have peaked, and water levels on the Chao Phraya have dropped slightly. Low tides in the coming days (November 3-15) will give the city time to drain standing floods and prepare for the next high tide, said Thailand’s Flood Relief Operating Center. The Don Muang Airport, a domestic airport, stopped operations after the runways flooded on October 25. However, the building housed the Flood Relief Operating Center and some 4,000 flood evacuees. The evacuees were forced to leave on October 25, and the Flood Relief Operating Center moved on October 29 when the building flooded. The airplanes shown in the image were decommissioned before the flood. Bangkok’s primary airport, Suvarnabhumi, is still operating and is expected to stay dry. 24/7 Emergency Operation Center for Flood, Storm and Landslide. (2011, October 24). Flood situation reports. Accessed November 1, 2011. Bangkok Post. (2011, November 1). All districts in Bangkok still ‘at risk.’ Accessed November 1, 2011. Bangkok Post. (2011, October 26). Chao Phraya on the brink. Accessed November 1, 2011. Don Muang Airport Guide. (2011, October 25). Don Muang Airport temporarily closed due to floods. Accessed November 1, 2011. Government of Thailand. (2011, November 1). Announcement on flooding situation in Bangkok. Published on ReliefWeb. Accessed November 1, 2011. Government of Thailand. (2011, November 1). FROC: Overall flood situation has improved. Published on ReliefWeb. Accessed November 1, 2011. Government of Thailand. (2011, October 30). Floods kill 373, affect 2 mil. Published on ReliefWeb. Accessed November 1, 2011. The Nation. (2011, November 2). Suvarnabhumi ‘will be safe.’ Accessed November 1, 2011, 5:30 EDT). Poomhirun, C., Prasertpolkrung, J., Hoonsara, S. (2011, October 30). FROC forced to move from Don Mueang. The Nation. Accessed November 1, 2011. The Nation. (n.d.) What can be expected. Accessed November 1, 2011. NASA Earth Observatory image created by Jesse Allen and Robert Simmon, using EO-1 ALI data provided courtesy of the NASA EO-1 team. Caption by Holli Riebeek. Climate change has already hit the Thai psyche. Almost every public opinion polls and surveys in the past years have been pointing in the same direction saying climate change and global warming are high on the Thai mindset , whether or not it is associated with sense of urgency, awareness or simply riding on a trend driven by corporate advertisements. Apart from that Thai people are increasingly aware of the possible affects of climate-change related events such as floods, , sea-level rise leading to coastal erosion in Bangkhuntien area, high incidence of infectious diseases such as dengue fever and Letrospirosis. In May 2007, over 36 organizations representing almost all sectors – government, media, private sector, entrepreneurs, NGOs and other civil society groups endorsed the Declaration on the Cooperation for Alleviating Global Warming’ in Bangkok. The declaration was supposed to kick start the implementation of the 5-year Action Plan for Global Warming Alleviation (2007-2012). The action plan set a bold target to reduce carbon emissions of Bangkok city by 15% by 2012 with different approaches ranging from improvement of transportation system, promotion of alternative energies, energy conservation , building retrofit, solid waste and wastewater management to expansion of green area. Now it is time for Bangkokians to cast their votes again to elect a new Bangkok governor and all the candidates are busy showing off their green credentials. And as expected, when the Thai society of environmental journalists organized a conference on “New Bangkok Governor’s Environmental Management Vision”, climate change was high on the agenda of all the major candidates. Bangkok metropolis like other megacities of Toronto, London and New York is one of the major source of carbon emissions, all of which have started implementing its climate action plan last year. If the current governor of Bangkok-Mr Apirak Kosayothin- is able to retain his post, Bangkok Climate Action Plan should not only be continued but also has to be realigned to gain momentum in order to achieve the targets and practical outcomes. What is going to happen with the climate action plan if we get new political leader is a question that everyone should be asking. It might be changed, re-prioritized, improved or scrapped. That is really depending on political will of the one who is elected, given the fact that environmental policies of other major candidates are not very different. Since the Nobel Peace Prize-wining Intergovernmental Panel on Climate Change (IPCC) put the final nail in the coffin of global warming skeptics last year (2007) as Ban Ki-moon Secretary-General of the United Nations has put it, new scientific findings pointed it out that the climate system seems to be more sensitive to the effects of increasing greenhouse gas concentrations that previously estimated. Climate scientists worldwide are calling for urgent action : global carbon emissions has to peak by 2015 and cut by far more than half by 2050 in order to prevent disastrous climate change from happening. Last but not least, climate change conference in Bali has set the road for a new agreement to be concluded in Copenhagen in December 2009. If we want to avoid disastrous climate change to happen, we will need a very strong and very ambitious agreement to be made by all countries. In this context, Bangkok Climate Action Plan, if we do it right, will set a good practice in helping world community to combat climate change. The next Bangkok governor, regardless of who it is , will have to exercise the leadership by placing ecological imperatives at the heart of city’s social and economic policy and development. The aim should be to not increase inequity but instead reduce the gap between political elites, consuming class and urban poor, as well as, ensuring participation of impacted communities in decision making processes on mitigation and adaptation options and assist these communities in funding and implementing climate adaptation measures. In the run up to the election of the new Bangkok governor, all citizens must remember that casting vote is to endorse not only the best political will but defining the future of our Bangkok in the warming world. Collective action is the only way out of the imminent crisis facing us.